Grew Up… in seconds. See, Leeloo wasn’t truly born, she was cloned. Her original version lived among the Mondoshawan, an extraterrestrial race dedicated to saving earth from a Great Evil that appears once every 5000 years. Unfortunately, while journeying to Earth to gather the five elements to stop the Great Evil, their ship was attacked, resulting in the death of everyone on board. In the wake of the Mondoshawan’s destruction, a group of scientists manage to find a human hand, which they are able to clone into the new and confused Leeloo. Living… in the hands of Korben Dallas, a cab driver in the year 2263. Leeloo falls into his cab by chance while escaping the facility where she has been recreated. She crashes through the top of his flying cab in what she describes as a “bad badaboom.” Speaking very little English, Leeloo is at the mercy of Dallas, who miraculously manages to help her find Cornelius, a priest who believes that Leeloo is the Fifth Element: the human element needed to destroy the Great Evil, which now threatens the Earth, and all other living beings. Profession… the Fifth Element. 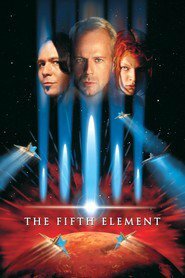 Leeloo’s purpose is to interact with the other four elements and destroy the Great Evil. Leeloo is essentially a weapon, but she might prove to be more than her simple, destructive purpose. Interests… learning. Leeloo is totally fresh to the world, but seems to be able to process information at an incredible rate. She can learn languages quite quickly, and by watching documentary footage she comes to understand much of human history, including the great atrocities humanity has committed. Relationship Status… single. She is a beautiful specimen, described by scientists as “perfect,” who isn't receptive to romantic advances, unleashing kung-fu fury if touched without her express permission. She hasn’t been alive very long, but so far she has only found real comfort in the company of the gruff cab driver, Korben Dallas. Challenge… saving humanity from the Great Evil. She doesn’t seem to fully understand her purpose, having the mind of a newborn. Still, she’s determined to fulfill her destiny as the Fifth Element. Unfortunately, the Great Evil isn’t going to go down without a fight, and has recruited the merciless industrialist Jean-Baptiste Emanuel Zorg to ensure that Leeloo doesn’t live long enough to pose a threat. Personality… innocent and strong-willed. She has a lot of fight in her, and even more bite. She also loves fun and has an intense and contagious laugh. Her ability to learn quickly makes her more and more human with each day as she learns how to fit into society. Leeloo is still so young that her personality is malleable and unformed – her ultimate temperament will probably depend on how people treat her in these trying times. Leeloo's popularity ranking on CharacTour is #1348 out of 5,000+ characters. See our top-ranked characters and read their profiles.